Yall. I LOVE Richmond. I attended VCU for my BFA in Photography and Film and it is honestly one of my favorite cities. If for some reason we had to move out of Southern Maryland, but still wanted to be semi-close to Washington, RVA is where we would go. The culture, the people, it’s seriously the best place ever. Tori is a sorority sister of mine (any other AOII ladies out there? ), and VCU is also the place where she met the love of her life, Anthony. Even though we have all moved away, it was only fitting that we come back for their engagement session in Downtown Richmond. To think that Tori and Anthony have been dating since they were 20 is crazy! Before they left Richmond to pursue their Masters degrees, Richmond was building this bridge right next to where they were living in the Southside and Tori was hoping it would be done before they moved, but of course it was not. 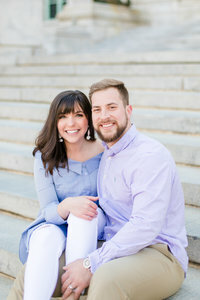 Anthony knew Tori always wanted to go and walk over the James River, so two years later, he proposed to her over the T. Tyler Potterfield Memorial Bridge. It was the perfect place especially since Richmond is where is all began! Tori had never seen him so nervous! So at the end of their engagement session, we went back to that same little bench on the bridge, and did a few portraits to document the proposal. Now, in just a few short months, they will be MARRIED in Turks & Caicos! But that’s not all – we’re taking a CRUISE to get there!! It’s basically going to be the coolest wedding ever and we’re SO excited to be a part of it!! !